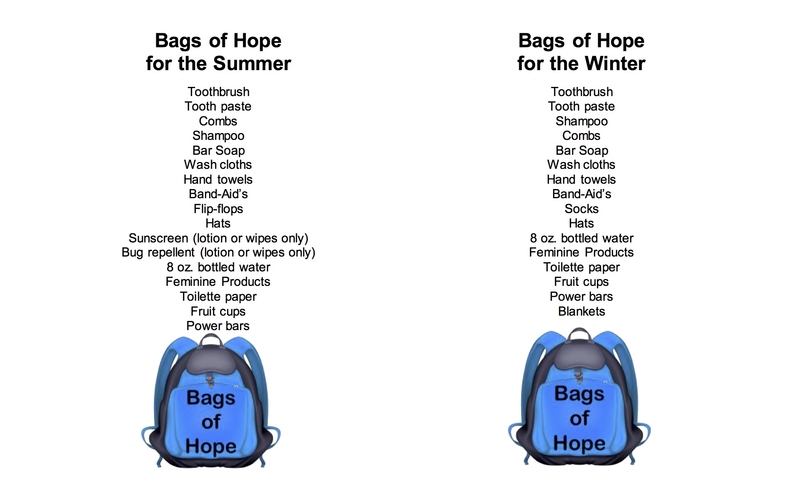 Bags of Hope are bags that are put together for the homeless population. We collect toiletry items and season item needs for several months. On the 5th Sunday months we celebrate Outreach Sunday and assemble the bags following worship. These bags are then taken to Remnant Cafe where we serve lunch to the homeless and the distribute the bags. We have two different lists -- a Summer list and a Winter list. The LIsts are below. Any contribution you would like to make would be gratefully received. If you wish to help by delivering the bags and serving lunch, contact the church office.